SWING STAGE - Building Maintenance Platform. 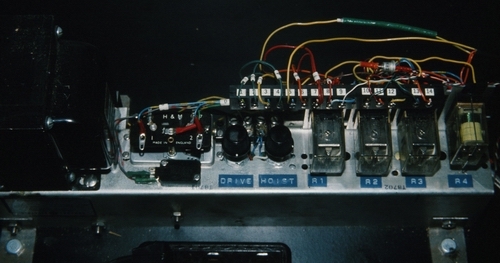 This Swing Stage mechanical display was another model that could be programmed to work continually, unattended. It could also be operated manually, to demonstrate it's capabilities. Tracks are laid permanently around the edge of the building roof, for the hoist trolley's travel. The work platform is hung from davits on the trolley, over the edge of the roof. The work platform, could be raised and lowered, controlled directly from the work platform itself, as can the travel of the trolley, along the roof tracks. Maintenance, and window washing etc., could be performed on all four sides of a building from top to bottom, without the operators ever leaving the work platform. This display model was also present at the opening ceremonies of the New Mirabel Airport in 1980. I was there to assist in it's installation. The model stood about five feet high from the floor. 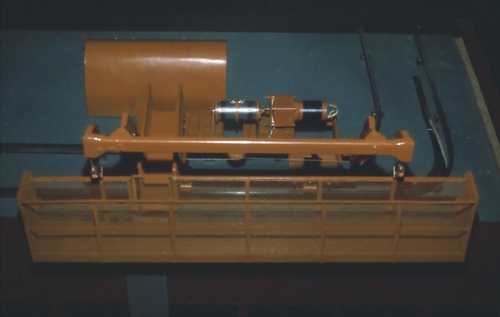 To the right, you can see a closer look at the roof trolley hoist, with the cover removed, and below that, a closer look at the programmable control unit. 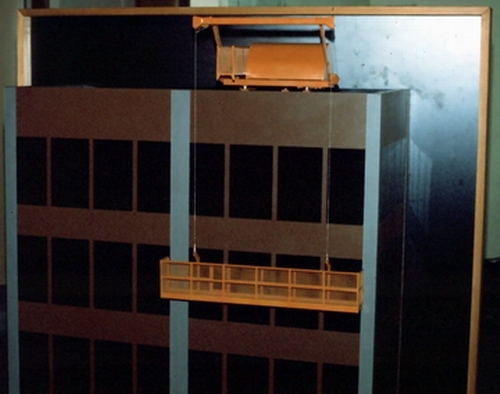 We built the hoist trolley, and Swing Stage platform from their detailed drawings, but the programmable control unit was designed and built by Brinkworth Models.